Emmaline Long has loved sheep since the day she was born, but it took her until 7th grade to convince her parents to let her get some of her own. In 2002, we started with two sheep (a wether Lincoln ram and a Lincoln/Hampshire cross), and have since grown to be as many as 50 ewes, although we usually have between 25 and 30 ewes depending on the time of year. Our flock is entirely purebred natural Lincolns, except for a few that are offspring from our original Lincoln/Hampshire cross. Located on approximately 50 acres of land in Bergen, NY, we chose the name Orchard View due to a small orchard of very old apple trees on our farm. Emmaline recently purchased the house next door, which will allow us to expand our pasture and flock over the next few years. We love our breeds size, luster and color of wool, and personalities. Emmaline is currently the Vice President of the National Lincoln Sheep Breeder's Association. 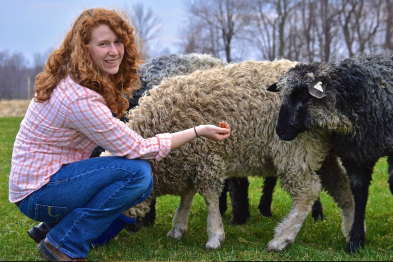 To learn more about Lincoln Longwool sheep in the United States, visit the National Lincoln Sheep Breeders Association. Our personal preference is dark colored wool, so we have been breeding our flock for darker colored wool. Our flock is mostly a family hobby and we spend our summer showing our sheep at several shows including: Maryland Sheep and Wool Festival, the Genesee County Fair, The Big E, and the NYS Sheep and Wool Festival. See our "Shows and Events" page for more information about where you can find us throughout the year! Awards we have received in recent years include Premier Breeder in 2012 at the Maryland Sheep and Wool Festival, and Best Fleece and Reserve Champion Ewe at the 2012 Big E. We also recently received Best Fleece with our yearling ram at the 2013 Big E show. Emmaline finished her Master's degree in the Animal Science department at Cornell University in 2017, while working as a crop manager at CY Farms. While the sheep are a family thing now, they all belong to Emmaline and she looks forward to continuing to grow and develop her flock in the coming years. Feel free to contact us with any questions you may have about our sheep, how we got started, or even maintaining a flock during college! We are also a proud member of The Livestock Conservancy. This organization's mission is genetic conservation and the promotion of heritage breeds. Lincolns are considered "threatened" by the Conservancy and our farm, like this organization is dedicated to preserving our breed's heritage, history, and culture. Long-wool sheep appear to have ancestry from white-fleeced sheep imported to England from the European continent during the Roman occupation. Evidence of this body-type of sheep with similar fleece exists as figurines from the continent dating to the second century. The next evidence of long-wool sheep comes from Lincolnshire, appearing as a detailed illustration in the 'Luttrell Psalter' written between 1320 and 1340. In approximately 1460, a brass memorial with a curly-fleeced sheep was placed on the Northleach Church, Gloustershire. The "old" Lincoln was first identified and depicted in the 1700's. Robert Bakewell (1725-95), a famous livestock breeder, used the "old" Lincoln with other native stock while creating his "new" Leicester sheep by using inbreeding. Later, Lincolnshire sheepmen used "new" Leicester rams on "old" coarse-wool Lincoln ewes to begin development of the "improved" Lincoln using selective crossbreeding. Many of the 'longwool' breeds likely have a similar developmental history involving Lincoln and Leicester foundations. The distinctly hardy "improved" Lincoln evolved during the 1800's toward the dual-purpose breed we have today. The "improved" Lincoln combined more quality meat with a higher quality of wool than the "old" Lincoln. Although the wool was of a finer diameter, it took dye very well and retained its strength for the combing and worsted spinning processes used at that time. It was this "improved" Lincoln that led to the accumulation of great wealth in Lincolnshire and surrounding counties for many decades. In the latter 1800's, the value of using the Lincoln in crossbreeding programs was recognized. Lincoln breeding sheep were exported world wide for upgrading local breeding stock. Breeds eventually developed by using Lincoln parents included Corriedale, Polwarth, Columbia, Bond, Armenian Semi-Course Wool, and Panama. From these breeds, second-generation breeds were subsequently developed in the US, such as Montadale and Targhee.